Free of its once great creator and filled to the brim with Disney dollars, the return of Star Wars to the big screen has conjured hype so thick you could cut through it with a lightsaber. But with so much riding on its Force-powered shoulders, does The Force Awakens do the near impossible and marry the universe we know and adore with a much-needed new direction? Yes, it bloody does. This is indeed the Star Wars sequel you were looking, hoping and praying for. Director JJ Abrams and co have created something wondrous - a new act in a timeless space opera that feels instantly recognisable while dancing effortlessly with new characters, places and narrative twists that rewrite the Star Wars status quo forever. The universe of the Force was in dire need of a modern tune up - one that took note of the reimagined successes of Star Trek on the big screen and Battlestar Galactica on the small, while simultaneously retaining that palpable magic that makes the lore of Star Wars so appealing. 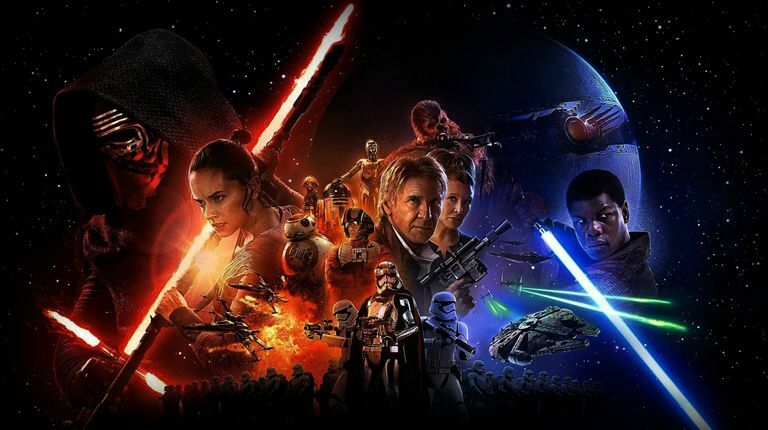 The Force Awakens is, to that end, a film fighting a war on two fronts - and it's a challenge it pulls off to a tee. Setting the story 30 years after Return Of The Jedi does present a few narrative gaps to fill, but the timeframe allows the core members of the Original Trilogy to return without the need for X-Men style CGI cosmetics. It's great seeing those familiar faces in the roles we know and love - and while Carrie Fisher's Leia sometimes comes across as a little trite, Harrison Ford is still electric as the aging Solo. Wrinkles or not, the lovable Corellian smuggler is more than a match for the bright-eyed new cast. Those heroic new additions - rebellious former Stormtrooper Finn (John Boyega), resilient scavenger Rey (Daisy Ridley) and Errol Flynn-esque Poe Dameron (Oscar Isaac) - bring a new energy to this much-loved universe, while Lawrence Kasdan's sharp and witty script gives them all the material they need to conjure a dazzling new dynamic that feels both unique and authentic. Ridley's Rey is the real revelation here - a convention defining breath of fresh air, she's the perfect heiress to Leia's powerful past mantle and true emotional heart of the story. Finn is another brilliant addition and serves as a surprising comic relief that wisely holds the film back from taking itself too seriously. Isaac's pilot extraordinaire Poe Dameron is equally enthralling, but he doesn't get nearly enough screen time as you'd hope and you're left pining for his Solo-esque rogue-ishness in the interim. His sparse presence is one of the few places where The Force Awakens stumbles. It introduces so many faces in its 136-minute run time that those outside the core team are often criminally underused. New villain Kylo Ren should well on his way to icon status - Adam Driver's impassioned performance provides a character unlike anything we've ever seen in the Star Wars film saga. Under perhaps the most delicate direction we've ever seen from JJ Abrams, this brutal, ruthless and deeply complicated antagonist proves the story with shades of grey that elevate the film's story immeasurably. Being free of the disarming timeline of the prequel trilogy, The Force Awakens also enjoys a completely new narrative that's neither heading for an already established predestination or adapting known material from another medium - and that freedom affords every line, scene and twist an energetic life that never falters. However, that doesn't stop The Force Awakens from retreading old ground a little too often - this is very much a spiritual successor to A New Hope and while the parallels in certain story beats has been a conscious one (Star Wars is all about the past repeating itself, after all), those beats can, at times, fall a little too centrally on the nose. But all this little niggles are easy to pick out in retrospect - when you're sat there in the cinema, The Force Awakens will make you smile so much you'll probably forget to breath. It is, quite literally, a breathtaking achievement - to balance the familiar lived-in world of Star Wars with captivating new elements that instantly belong. Is this the best Star Wars film ever made? Of course not, how could it be? But it is the best cinematic incarnation since Return Of The Jedi, and few compliments come as high or as prestigious as that.